Coburn’s Cobalt NX Lens Generator continues to push the limits to produce superior quality lenses in terms of form and finish. 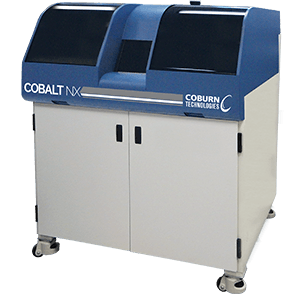 Building on the Cobalt heritage, the new generation Cobalt NX incorporates a number of enhancements including a linear motor and an integrated spindle to provide extra precision and more accurate lens geometry. Enhanced Lens Quality: The quality of the lenses produced with the Cobalt NX is far superior to that of previous generators. Cobalt NX is designed for processing for all indexes of lenses (1.498 to 1.74). Auto-Calibration: Manual calibration is still available for those customers wanting to still control this process, but for those who want an automated machine, the Cobalt NX introduces automatic calibration for more efficient and faster processing. Interrupted Cut: Interrupted cut brings a new feature to Coburn’s lens generators, which will available on both the x- and v-axis. This eliminates the need for a granulator.